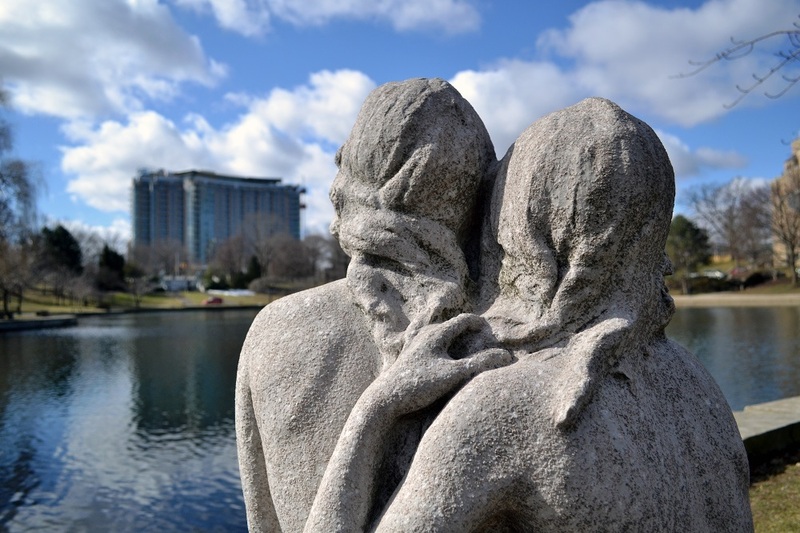 On the banks of the paradisaical Wade Lagoon, two stark, white figures share an intimate moment with one another. 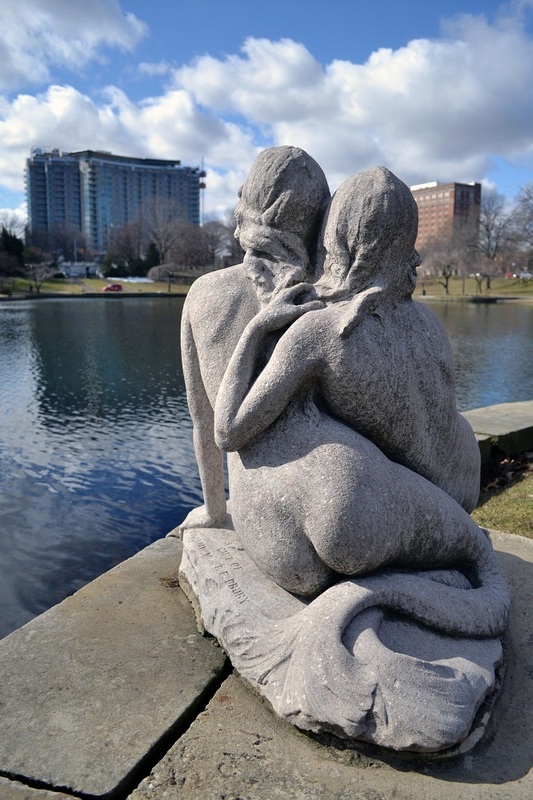 An echo of the similarly white Cleveland Museum of Art looming on a hill behind them, the Mermaids of Earth care not for the beauty that surrounds them, for they bring their own. One figure's eyes are fixed on the sky, facing the sunset. Her head pushes forward, gently and confidently. Her hands rest on the rock in front of her, displaying her bare chest. The other mermaid is drawn back. The hair swept behind her ear reveals a face of worry or perhaps intrigue. She clutches lovingly and protectively to the smooth contours of her friend's back and shoulders. The two figures could not be any more stylistically opposed: where one sees wonder and awe, the other sees anxiety and fear. One's body is strong and upright, the other's: soft and draped. One's bare chest and bottom are unabashedly on display, the other's are coyly concealed. Yet in these stark differences, a clear and common love shines through, as gorgeous as valley they inhabit. 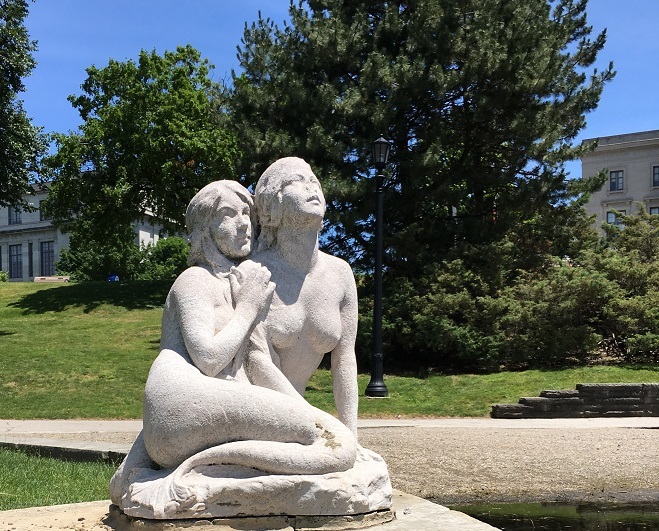 Mermaids of Earth was begun by Fidardo Landi, who passed away in 1918 before their completion. 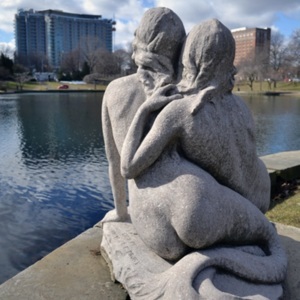 The lovers laid somewhere, incomplete and unconsummated, until 1929 when Chester Beach finished the piece, and it was installed in Wade Lagoon as a gift from Mr. and Mrs. D.E. Drury. Location: Wade Lagoon, East Blvd. 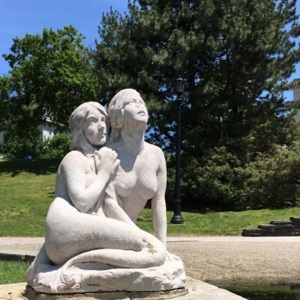 : Fidardo Landi and Chester Beach (Finished), “Mermaids of Earth,” Ohio Outdoor Sculpture Inventory, accessed April 18, 2019, http://oosi.sculpturecenter.org/items/show/1366.